Looking for motor trade insurance and have a criminal conviction or bankruptcy? 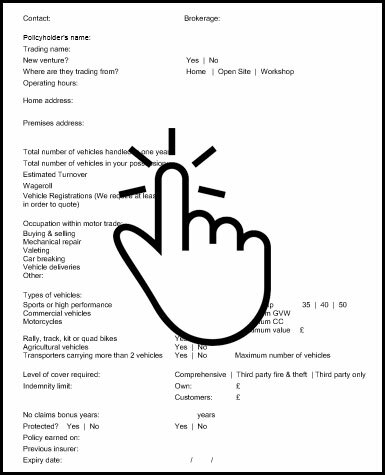 If you are in the motor trade business and are struggling to get insured due to a criminal conviction or previous bankruptcy, call SIS today on 0161 969 6040 or click on the form below to download, complete, and send to us at this address. Motor trade insurance with a criminal conviction is difficult to find. The high cost of premiums almost prohibitive to buying cover. Nonetheless, insurance cover is a legal requirement for “road risks” and will protect motor traders whether they are a dealership, buying and selling, specialist importers or one-man-band mechanics. SIS (Sale Insurance Services Ltd) is a specialist insurance broker dealing in niche products including motor trade insurance for reformed offenders with a criminal record. Your previous criminal convictions are not necessarily a guide to your future. With many years experience as a specialist intermediary with a range of specialist insurance products, we will find you affordable motor trade insurance with a criminal record or with previous refusals from other companies. You may have been denied cover or had coved declined by your previous insurer. Our philosophy is simple – disclose everything, leave nothing out, and we’ll guarantee indemnity on your claims. Disabilities and all previous claims must also be disclosed. Generally, insurers can now access data on all previous claims within the last 3 to 5 years, so withholding this information is pointless. So whatever your motor trade insurance requirements are make sure you ask our experienced staff for advice and assistance in accessing this difficult and complex market. At SIS we offer many types of policies that will suit most needs, whether you’re a part time or full time enthusiast buying and selling from home, or a restorer or collector. Motor Mechanics: Mechanics with or without premises and for those requiring Road Risks cover. Customer vehicle collection & delivery including recovery and test driving. Car Valetors: Including working on clients premises or mobile Valetors. Provides Road Risks and cover whilst working on vehicles. Trade Plater’s (Delivery Drivers): Single vehicle or transporters deliveries throughout EU or as cargo worldwide. Road Risk cover for customer vehicles. Specialist lifting gear, Cover for business interruption and diminution in value claims for vehicles conveyed. Accessory Fitters: Fitters of accessories, GPS devices, armour plating, adaptation for disabled driver, roof racks, tow bars, lifting gear and refrigeration. Customer vehicles, Road Risks. Car Dealers and body repairers of all sizes.